This entry was posted in Fireplaces on February 11, 2019 by The Original Flame Author. Power Outages create an atmosphere of uncertainty and catch us off-guard. Since power outages are a rare phenomenon, we often neglect it and do not prepare for it. But, do you know what is worse than a power outage? Power outage during the cold winter months. During the cold months, you are not only left in the dark due to a power outage but also face severe cold without any source of heat. It is one thing to prepare for a certain event and another to be prepared for an uncertain crisis. It is this planning and preparation that makes all the difference in the heat of the moment. The first basic rule of handling a power outage is depending on sources and objects that do not run on electricity. This includes both, non-electric sources of light and heat. If you ever get caught in a power outage and happen to have a non-electric fireplace at home, you will be a happy person. 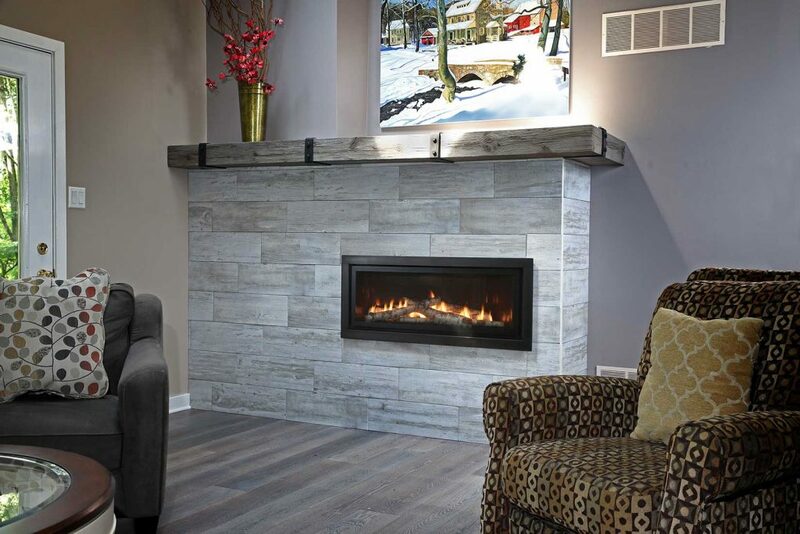 A wood or a gas fireplace will serve all your heat and light needs in such a time of crisis. All gas stoves, fireplaces, and inserts operate safely during the time of a power outage, producing radiant heat and warming up the house. (with the exception of power vented models) It should be noted that the blower in the fireplace will not work without electricity. However, the blower is not necessary for ensuring the safety and proper operation of the fireplace. Most gas fireplaces feature ignition packs and battery backups that allow you to ignite the fireplace even without power. Also, direct vents fireplaces are sealed which vents the emissions directly to the exterior of the home; For the venting too, no electricity is needed, and the natural flow of the rising warm air is utilized. Thus, the gas fireplace can be operated safely without any need for electricity. Now that you know how you can safely use a gas fireplace during a power outage, let us move on to see how you can use a wood fireplace during a blackout. Traditional wood-burning fireplaces are one of the oldest sources of heat and have been around since eternity. These function entirely naturally using natural wood as fuel. The modern wood-burning fireplaces, inserts, and stoves are much more technically advanced. However, these advanced ones still function in a way similar to the old wood-burning ones. The modern fireplaces too, just like the old ones utilize the natural buoyancy of warm air to push out the smoke from the home. This is done without the need for any electricity. Wood fireplaces, just like gas ones produce heat safely, regardless of whether the blower is in operation or not. Making your emergency kit – Whenever you are thinking of preparing for a crisis that might last for a few days, the first thought is ideally to pack an emergency kit of supplies. Since you are packing this particular kit for a power outage, you should place this kit in a place that is easily accessible in the dark too. The kit should contain the following necessary items for fighting the cold and the darkness: candles, blanket, dry food, a box of matches, flashlight etc. Keeping Warm – After you have prepared your emergency kit, you should consider the different options that will keep you warm during the outage. If you do not have any non-electric sources of heat in your home, you should consider installing a gas or a wood fireplace. This will be effective in providing you with heat and light without any electricity. Apart from the fireplace, you should also keep blankets, sweaters, socks and hand warmers handy. Ensuring you have light – When you have made your heating arrangements and sorted out your emergency kit, the next thing that you will have to look into is your light sources. You should ensure that the kit you prepare contains multiple sources of light like matches, candles, flashlights, and batteries for it. Gas or wood fireplaces and inserts radiate heat and keep you warm without any electricity usage, providing an additional and completely safe source of light. Many modern fireplaces feature receivers and ignition packs that are powered by battery as a backup power source or they have a standing pilot light. This means that you will be able to light up your fireplace and enjoy instant heat even during a power outage, with the touch of a single button. The direct vent technology in many modern fireplaces prevents the cold air from entering the room through the chimney. The direct vent is also effective in maintaining the quality of air within the room and further prevents the warm air from escaping through the chimney. A fireplace will provide you efficient warmth and light without the need for a power supply or fan. They have been designed to circulate the warm air using the natural movement of air or the convection currents. These efficient fireplaces provide light, heat, and warmth during a power failure. If you live in or around Peterborough, no matter what kind of fireplace you are looking for, you can find one at The Original Flame. You will also find wood and gas stoves and inserts with us, that are effective in heating homes during a power outage too. We will help you in not only choosing a fireplace but also install it and provide you with regular maintenance services. Feel free to walk into our store for any enquiries!